QU’s Amanda Colin about to net the winning goal. HAMDEN, CT- The #4 ranked Boston College Eagles found themselves falling to the Quinnipiac Bobcats Tuesday night in a game that featured no scoring until the last few minutes of the game. 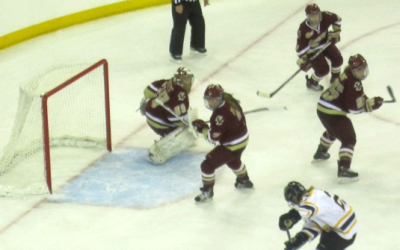 Boston College goalie Corinne Boyles faced only 9 shots in the first two periods and saved them all, as Quinnipiac goalie Chelsea Laden faced 19 through 2 and saved them as well. By the end of the game Boyles would face 9 more shots and Laden another 15. Late in the third period with overtime looming the Eagles stormed in on Laden at close range and in the scrum in the net, Emily Pfalzer got it by the keeper assisted by Emily Field and Alex Carpenter. There had been a variety of penalties in the game, but none had resulted in any goals. Laden and the defense had to fend off some scares on some BC power plays but that was the extent of it. However at 18:00 exactly BC’s Taylor Wasylk went into the box for high sticking in a period that had already had 6 other penalties. This gave Quinnipiac exactly 2 minutes in the game and 2 minutes of a power play to try to make something happen. With less than a minute to play Laden raced for the bench and it was a 6 on 4. Following a play stoppage with 16 seconds left, QU called a time out. Play resumed and 6 seconds later Kelly Babstock got it by Boyles, assisted by Kosta and to overtime the two teams went. When overtime kicked off, it was only 35 seconds before Amanda Colin swept in to the right of Boyles and in, assisted by Breann Frykas and Melissa Perry. An interesting ending indeed. BC drops to 8-4-1 in the non conference match up, QU is now 7-7-1, and will be in just a few days up at UConn for the tournament.